An image of the sun on Feb. 15, 2011, using composite data of the sun's surface from SDO/HMI and the sun's corona from SDO/AIA. The cutout region shows (bottom) the five rotating sunspots of the active region (AR 11158), and (top) the bright release of light from the X-class solar flare. The most powerful solar flare unleashed from the sun in nearly five years was triggered by interactions between dark regions on the solar surface that rotate and twist the sun's magnetic field, a new study shows. Researchers at the University of Central Lancashire in England studied observations of the sun's flaring region taken over a five-day period by NASA's Solar Dynamics Observatory (SDO). 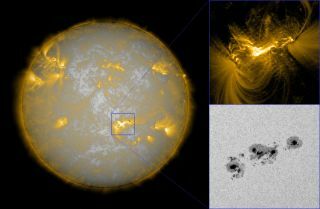 They found that the rotation of these dark regions, called sunspots, played a role in a massive solar flare that erupted from the sun in February. Brown presented the findings on April 20 at the Royal Astronomical Society's National Astronomy Meeting in Wales. The flare erupted at 8:50 p.m. EST on Feb.14 (0150 GMT Feb. 15), sending a massive wave of charged particles into space. This mega flare, registered as Class X2.2, was the largest one recorded since December 2006, and was the first flare of the current solar cycle to receive the most powerful "X-Class" designation. From the five days of observation from SDO, Brown found that the active flaring region contained five newly emerged sunspots. All five of the sunspots rotated between 50 and 130 degrees, some in a clockwise direction and others in a counterclockwise direction, over the five days of observations. "Rotating sunspots are an extremely efficient way to inject energy into the magnetic field of the sun's atmosphere," Brown said. "With five sunspots rotating at the same time enough energy has been injected into the atmospheric magnetic field to produce the largest solar flare seen for almost 5 years."